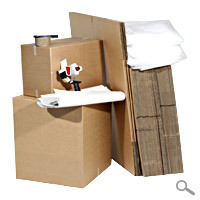 Our 4 bedroom moving pack is great value and packed with high quality removal boxes. Ideal when you are moving and have a lot of things to move, wrap and protect. This pack includes: 45 B1 Large boxes 18"x10"x12" 11 B6 Medium boxes 12"x9.5"x9.5" 4 B2 Extra large boxes 18"x18"x20" 50 Sheets of glass/china wrap paper 15m Bubble wrap 2 Packing tapes Tape Gun Pen Price includes FREE NEXT WORKING DAY DELIVERY.